The burden of God has placed upon my heart is twofold: first to help clarify the biblical doctrine of eldership and second, to help church elderships function effectively. This book is intended to fulfill the first purpose, so it is primarily doctrinal and exegetical in nature. To fulfill the second purpose, I have developed additional written and audio materials that will promote effective leadership and help train future elders. It is not enough merely to have an eldership; the eldership must be actively functioning, competent, and spiritually alive. 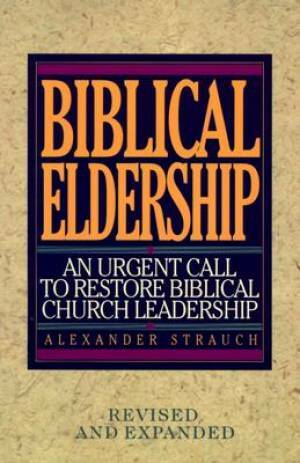 Biblical Eldership : An Urgent Call To Restore Biblical Church Leadership by Strauch, Alexander was published by Lewis And Roth Publishers in June 1995 and is our 22977th best seller. The ISBN for Biblical Eldership : An Urgent Call To Restore Biblical Church Leadership is 9780936083117. Be the first to review Biblical Eldership : An Urgent Call To Restore Biblical Church Leadership! Got a question? No problem! Just click here to ask us about Biblical Eldership : An Urgent Call To Restore Biblical Church Leadership.